My nephew Vince loves to play guitar. Although he has no real guitar, but he played broom as his guitar. Hubby tries to buy toy guitar but he don’t like to play because he don’t like the sound and he likes the real sound of guitar. Anyway, when we are goes to the SM mall, Vince was stopped the guitar store and he played the kind of new sterling ax30 at guitar center. 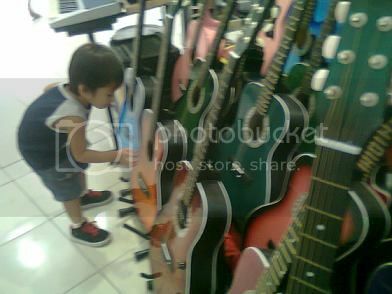 He really loves to play guitar and I want to buy for him a real guitar but I need to earn more. Because I know that he has a future in music. Vince stopped and plays the guitar while walking beside the store. If he likes playing a guitar, why not enrol him to a class? It might be good to him if he’s interested in playing. He might be a good guitar player someday! I think your nephew will be a good musician in the future because he is showing interest on music. My husband bought my 5-yr-old daughter an electric guitar – a real full size one – two Christmases ago. Now, it’s just sitting in the storage room waiting for my daughter to be old enough to play with it. I suggest you get your son a small ukelele first which costs just around 800pesos. He can practice strumming until he’s big enough for a real guitar. It’s great to see a kid who shows great interest in music at such a young age.